Beautiful executive home sitting on a premium, oversized lot backing up to the water! Luxurious 4 bed, 4 bath, in addition to office & upstairs bonus room which can be used as the 5th bedroom. The layout of the home flows impeccably & all of the living space can be used in a variety of ways. Wonderfully maintained home featuring beveled glass double entry doors, real hardwood flooring, coffered ceilings throughout formal living & dining rooms as well as the den, huge open kitchen with tons of upgrades, tiled kitchen and breakfast nook, 2 patios on the pool deck are perfect for entertaining! The spacious and freshly painted deck surrounds the beautiful custom pool with waterfall, spillover spa & covered by pool cage. Gorgeous gourmet kitchen features stainless appliances complete with double oven, large island, abundance of wood cabinets with convenient storage options, granite counter tops, butler's pantry with glass door cabinets & lighted displays. Laundry room & storage are conveniently placed next to kitchen w/ high efficiency washer and dryer. The master suite is downstairs, separate from the other 3 bedrooms. Bed 4 features a walk in closet, quick access to the bath w/shower and a door for pool deck. Bed 3 has private access to covered patio. Upstairs there is a huge room, full bath & full sized closet which can be used multiple ways! Oversized 3 car garage has built in cabinetry & corian counters for all of your storage needs. 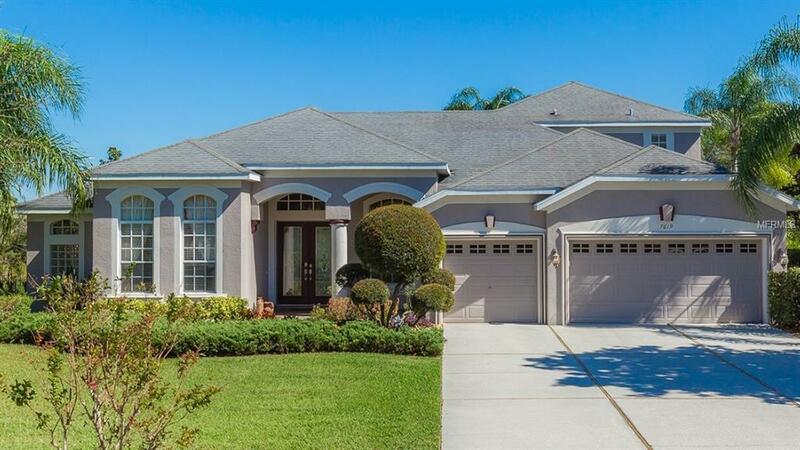 Great location with easy access to Pinellas, Veterans Exp, TIA & I-75.